Belmont barber chairs have been around since the 1930’s. Back then, the Takara Belmont Company was still known as Takara Chuzo Ltd. and was only operating in Japan. In 1956, the company established its first branch in the United States. It then went on to establish another branch in London in 1959. The 50’s was also the time when the company developed its manual hydraulic adjustable barber chairs. In 1962, it introduced the world’s first electric barber chair. By 1969, the company was renamed to Takara Belmont. It was also around the same year that the Takara Belmont Company acquired Koken, Incorporated. Belmont barber chairs are now famous for their elegant designs. Takara Belmont also claims to be the trend setter of barber chair designs and other salon equipment. Not too long ago, the company started selling legacy Koken barber chairs. Koken barber chairs are known for their classic hydraulic design. Kokens are always created from the finest components. They have always been that way. Their tufted leather seats, cushioned foot rest and arm rest are indications of excellent workmanship. Most of the time, they are fitted with frames that have complex wood and metal carvings. An antique Koken barber chair from Belmont is highly desired by a lot of collectors. When it comes to barber chairs, the Takara Belmont Company has always been the front runner. Today, it is the world leader in salon, spa and barber chair designs. Belmont is famous for its high quality products and barber chair designs. Traditional chairs are notably well known in some parts of Europe. These days, the company is coming up with more modern designs that are both practical and elegant at the same time. 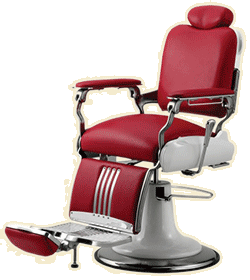 In case you are searching for a Belmont barber chair, you’ll be able to find one online. There are various web sites that offer these chairs for sale. The most well known ones are eBay, Craigslist, Multiply, Facebook and several antique retailers and pawnshops that have online presence. If you’re not very knowledgeable about the various types of Belmont’s barber chairs, you can check out the official web site at www.takarabelmont.com and learn more about products. Be sure to choose Beauty instead of Dental. Please send me a catalog for barber chairs.